Evaluation sheets are often called “happy sheets”… often there isn’t anything “happy” about them! Participants groan and instead of leaving the workshop energised and reflecting of a great workshop they leave with a form to complete and a groan. Evaluation is critical for the facilitator: to report to management, improve our skills, complete a project report, further develop the workshop etc. How can we lighten the process and make the happy sheets happy? I thought I would share some of the techniques we have been using and would love to hear some ideas from others. Make the evaluation a group activity. Write up 4 or 5 targeted evaluation questions on pieces of flip chart and put them up around the room. Divide the group into groups of 3 or 4 and ask them to discuss and complete the pages. A simple advantage of this is movement – often workshops involve a lot of sitting, getting people up helps the blood flow and increasing thinking. Everyone will remember different aspects of the workshop and have different perspectives, groups discussion allows the workshop to be reviewed by a team and further deepen some of the learnings. If flips charts aren’t an option, or the rooms size won’t enable moving around, I often ask people to work with the person sitting beside them and complete the evaluation sheet together. Once again the discussion adds to the depth of feedback. A dart board approach can be used where people rate various aspects of the workshop by putting a cross on a dart board – with the bulls eye meaning “the workshop was spot on”. 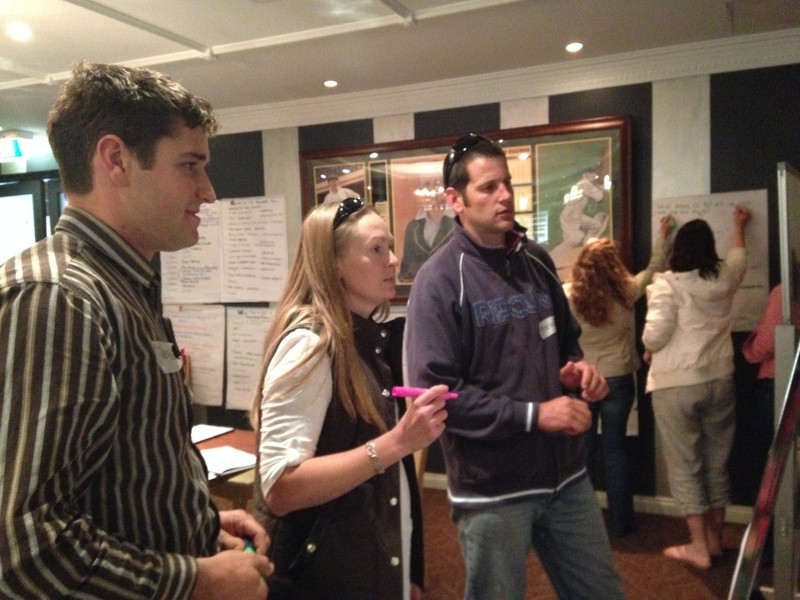 A dart board can be drawn up on a flip chart at the front of the room and everyone files past and completes it. Once again some movement and interest at the end helps to keep the energy levels up. A quick method with a larger group that works well with the sticky wall is ask participants to write their expectation on a piece of A5 paper at the beginning of the workshop, at the end they take their expectation off the wall and comment on how well this has been met. How do you make evaluations “happy”? Please post or email me your ideas and I can include them in another blog. May 2014 bring all you hope for! Some great ideas, I will be pleased to give them a go!! Thanks.